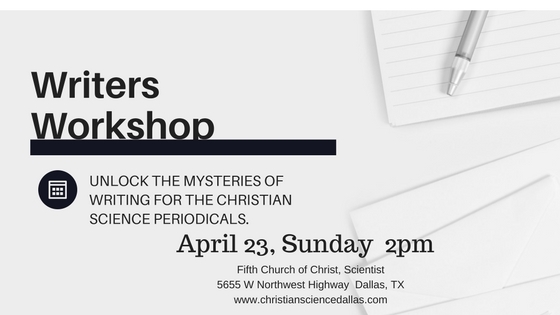 If you’ve thought about writing for the Christian Science periodicals but weren’t sure how to get started, this writer’s workshop is for you! There will be a writing exercise to help get that pen moving or computer humming. And then there will be a discussion about the next steps. This is the first meeting of its kind in the U.S. A recording might be made to help the Publishing Society further develop meetings like this. Please RSVP so we can ensure there are enough spaces set up. Call 214-361-1625 or send email to: FifthClerk@sbcglobal.net. To prepare, read the March 2017 Christian Science Journal interview with Barbara Vining and Tony Lobl. Also review the submission guidelines for articles and testimonies at https://jsh.christianscience.com/submit. You might also think about what you’d write and even start drafting an article to bring with you. After this meeting, there will be small follow-up meetings via Skype to help you edit and fine-tune your submissions. Next Next post: Are You Ready to Take the First Step?